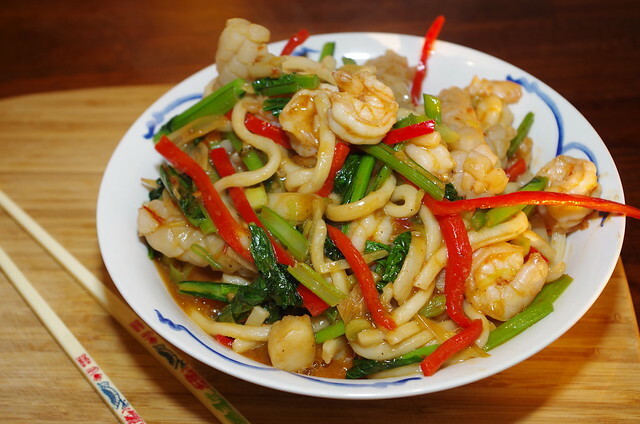 Not an actual Chinese recipe as such, rather something with Chinese flavours and ingredients that I like to eat. It’s been a while since I posted anything, must try harder! 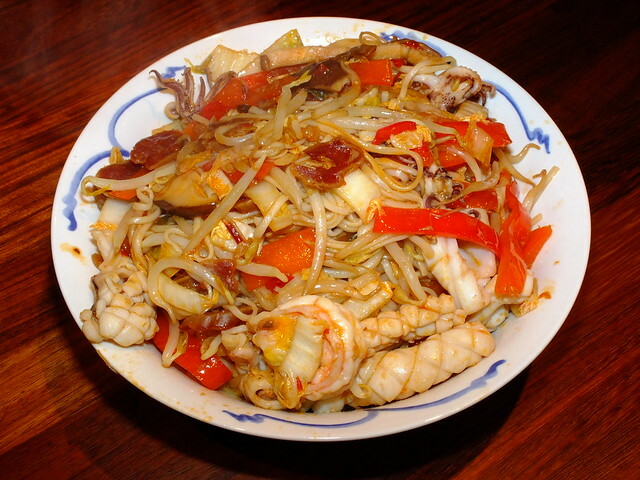 This dish is based on something I saw on the telly, on a Hairy Bikers in Hong Kong programme. 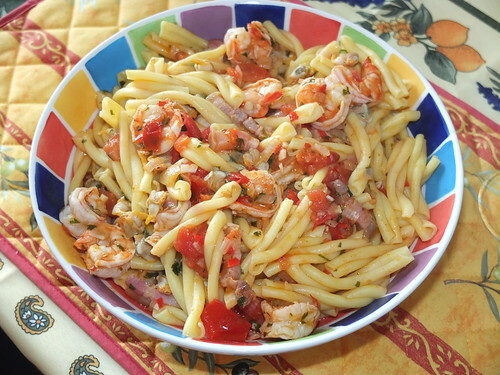 Seafood pasta with pancetta and tomatoes, a photo by La belle dame sans souci on Flickr. A nice Summery dish for the warm weather that has finally arrived. The seafood was king prawns, marinaded in a mixture of olive oil, lime juice, Scotch bonnet chilli, garlic, shallot, chopped coriander, salt and pepper. Then I added the king prawns and their marinade and cooked them for a bit, adding a small glass of white wine to help make a sauce. Finally, just before serving, I added in some ready-coked cockles and warmed them through. I’d already cooked some fresh egg gemelli and everything was mixed together and served. Another real comfort food classic supper. I think that lots of people love fish pie, it is the combination of the golden mashed potato topping, the creamy sauce and the mixture of soft fish that makes it so delicious. You can use lots of different types of fish, but I think that a white fish and salmon combination is hard to beat. The salmon gives it some colour as well as a different texture. Smoked fish is a good addition too, but I would always avoid that smoked haddock that is dyed bright yellow. Mussels and prawns are nice in a fish pie too. For this pie, I used pollack, Pacific wild salmon and some cooked and peeled king prawns. 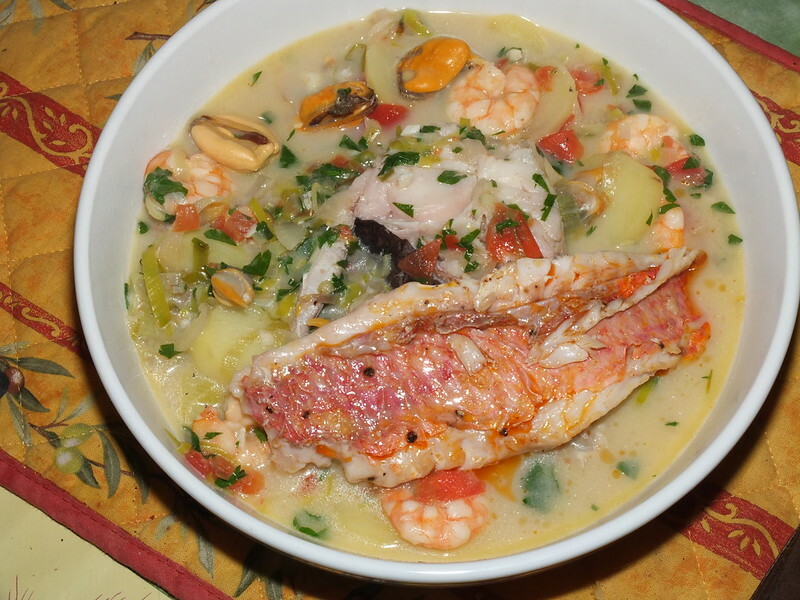 I skinned the fish, cut it into large pieces and poached it in some milk with parsley stalks and a couple of bay leaves and once the fish was part-cooked, I drained off the milk and used it to make a white sauce, which also included some chopped parsley, salt, pepper and some white wine. 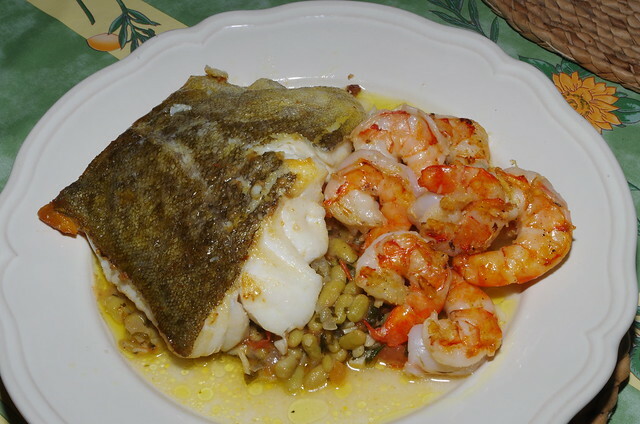 The fish was gently flaked and added to an oven-proof dish with the prawns and the white sauce carefully mixed in, making sure not to break the fish up too much. There are lots of other things you can do with the basic fish filling. Adding chopped hard-boiled eggs is nice, as is mixing some sliced leeks, sautéed in butter, to the mixture. 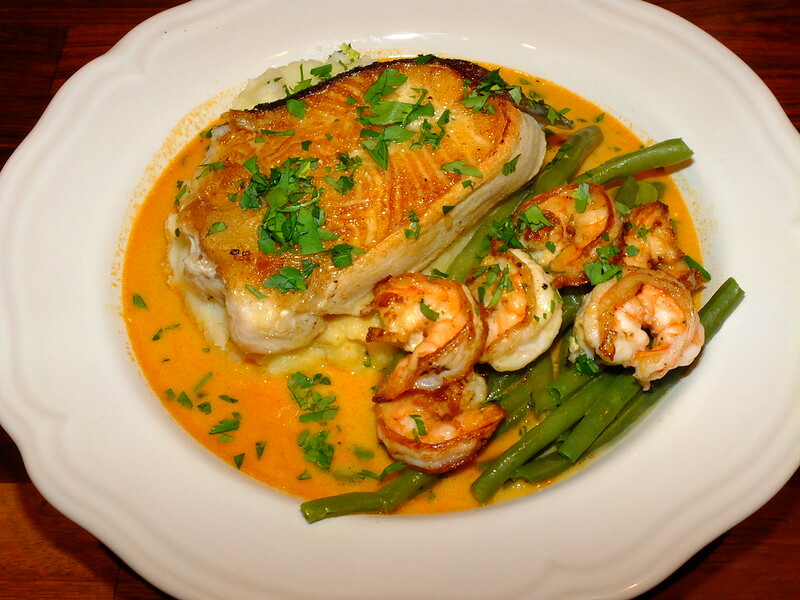 The important thing is to keep the dish reasonably simple so that the fish is the star, making sure that any other additions are there in a supporting role. Anyway, I left the fish filling to cool before topping it with some simple mashed potato and then baked it in a hot oven until the potato was golden on top. Some people like to mix cheese with the mash, or even use a cheese sauce with the fish, but I think that the cheese has a tendency to overpower the delicate flavours of the fish. 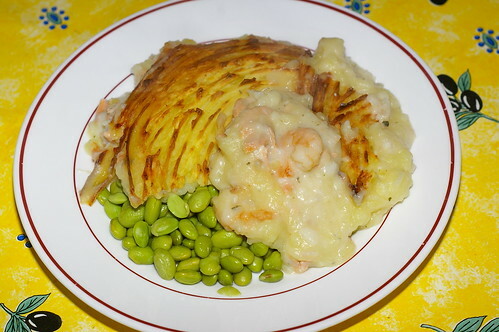 I do think that you need some colour contrast on the plate, though and I cooked some frozen edamame beans (also known as soy beans) to accompany the fish pie. You could just as easily serve frozen peas, but I like these beans. You could drink a white wine with fish pie quite easily, a white Burgundy or Bordeaux would work well, as would similar wines from the New World, particularly some of the Chilean whites which are incredibly well made and flavoursome but I chose a Bordeaux rosé, Domaine de Sours, the second wine from the Château de Sours. This wine is widely available and is mainly Merlot with some Cabernet Franc to add backbone. It is very fruity and has a fair amount of depth. 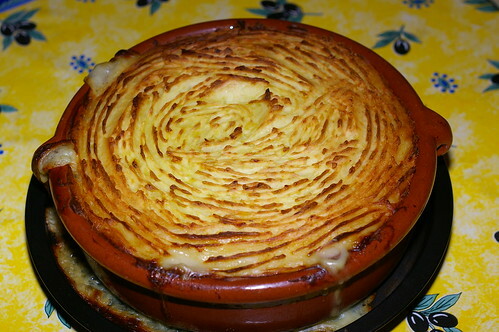 As a dry wine it has a crispness that works well with fish pie, the acidity cuts through the creaminess of the food and balances the dish nicely.